For Section 8 we look at the monkey energy of honor. 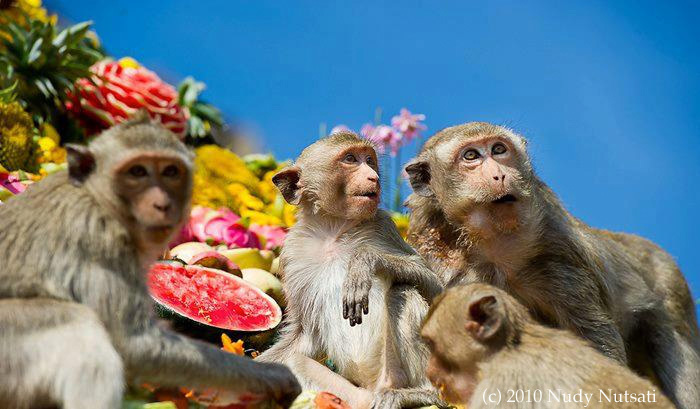 Every year in late November the city of Lop Buri in Thailand provides an annual feast for their revered monkeys at the Monkey Temple. The colorful buffet soon sparks a feeding frenzy for the 3000 monkeys that have lived in this town for centuries. Locals believe that they are the direct descendants of Hindu monkey god Hanuman. And while some consider them a nuisance, many more believe the macaques are a symbol of prosperity and fortune. Because of his bravery, perseverance, strength and devoted service, Hanuman is regarded as a perfect symbol of selflessness and loyalty. This section of the 2016 Mandala of the Year asks us to examine how well honor plays out in our lives, both with ourselves and with others. Do we honor our bodies, our lives, the work that we do, our homes, our possessions, our families, our friends, our neighbors, our co-workers? Do we wait until others honor us before we honor them? Do our actions for ourselves and with others speak of honor or disrespect? You can honor them by accepting them for who they are, not expecting change, and letting them live their own way in peace, but at the same time honor yourself and your own right to live in peace as well. Which means choosing NOT to be in their presence when they are abusing you. Be sure to download/color the August 2016 Mandala of the Month.